It is generally agreed that there is a strong environmental awareness in Minnesota -- one that influences the way the state conserves its natural resources. 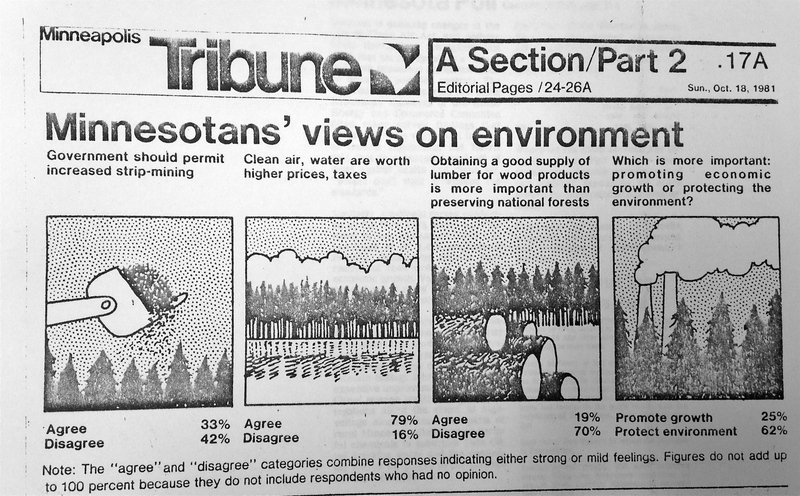 According to a 1981 poll published in the Minneapolis Tribune asking Minnesotans to choose between promoting economic growth or protecting the environment, 62% of the respondents thought that protecting the environment was more important. However, what set this story apart was not only the ethic of conservation among Minnesota's residents but also their willingness to take action. The popular mobilization in defense of the Minnesota Boundary Waters in the late 1970s serves as an early example. To protect this area from overdevelopment, a coalition of activists and organizations inside and outside of the government banded together to get Minnesota’s Boundary Waters federally designated as a Wilderness Area. This culminated in the passage of the 1978 Boundary Waters Canoe Area Wilderness Act. In the aftermath of this environmental victory, many of the organizations now had momentum and experience, and were ready for a new crusade. When acid rain first begin to garner state-wide attention as a threat to Minnesota’s environment, it became clear that the wilderness these groups had just fought to protect was newly endangered. Moreover, the concern extended beyond the condition of the sensitive lakes in Minnesota’s northeast corner: acid rain threatened the state’s environment as a whole. This, in turn, stimulated public calls for government action. The attorney representing the Minnesota Public Research Group, Michelle Morley, explained it with this statement, “Sure, it will [cost] a lot. But we will do it again, each time if we have to. 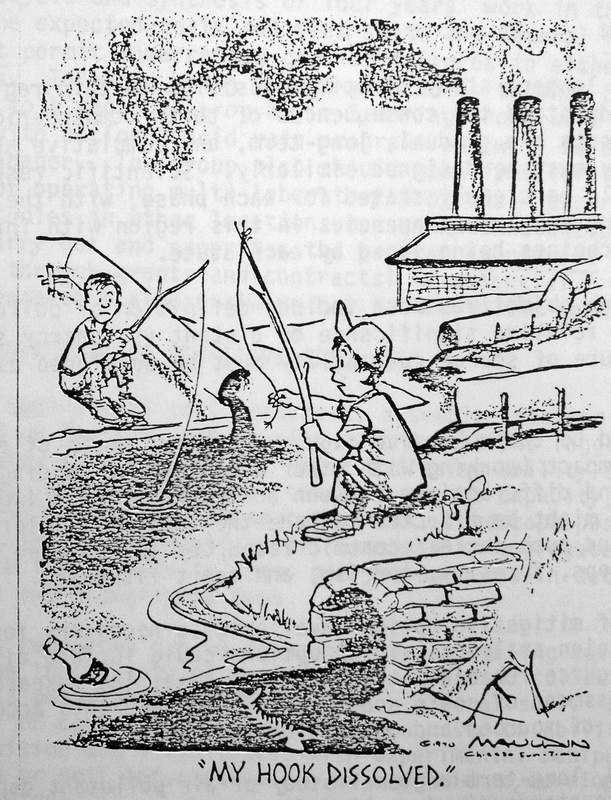 Who’s going to put a price tag on the air we breathe; on the quality of our air and water?” With this question, Morley expanded the conversation from defense of a single wilderness area to protection of air and water -- basic necessities of all living things. The same Minneapolis Tribune poll noted above echoed Morley’s sentiments. When asked whether clean air and water were worth paying higher taxes, 79% of the respondents answered favorably. Minnesotans proved willing to put their money where their mouths were. 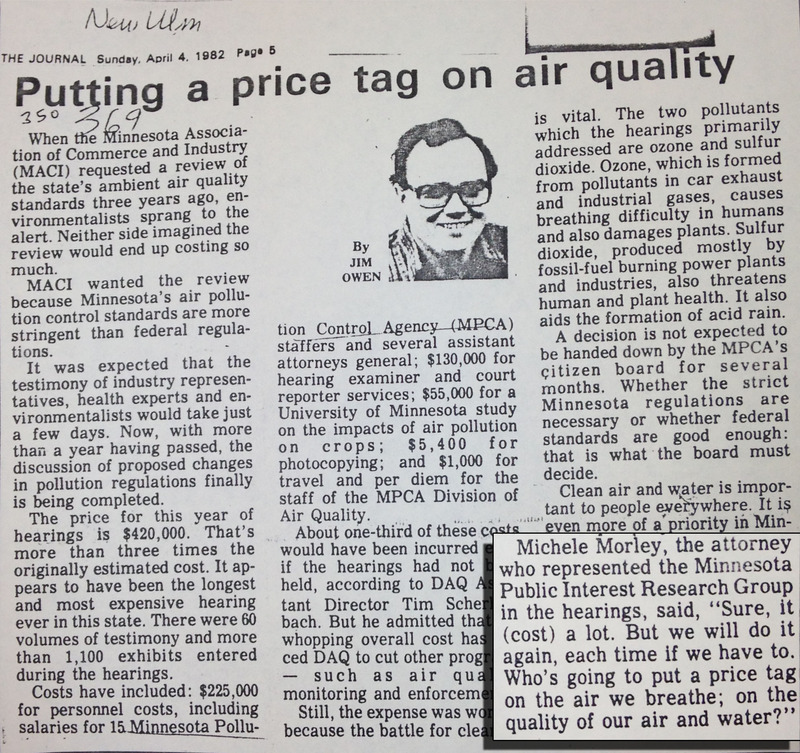 "Putting a Price on Air Quality"
Maja Black, Sarah Goodman, and the Minnesota Environments Team, “Laying the Groundwork,” Minnesota Environments, accessed April 26, 2019, http://mnenvironments.carleton.edu/items/show/24. On acid rain, see Gregory Pratt, "Dissecting a Nation-Leading Legacy: The Minnesota Acid Rain Story," in Two Cities, One Hinterland: An Environmental History of the Twin Cities and Greater Minnesota, eds. George Vrtis and Christopher W. Wells (Book manuscript in progress, 2014).